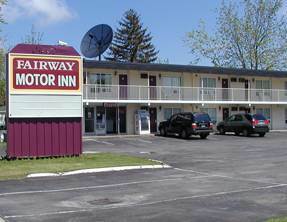 Only a short walk to the fun and excitement in Niagara Falls, Ontario including the Casino Niagara, Skylon Tower Attractions and Clifton Hill Attractions, is the Fairway Motor Inn Motel. The motel is located on Fallsview Boulevard in the heart of the Fallsview District, the home or great dining, attractions and entertainment in Niagara Falls. This Niagara Falls Motel offers guests with a wide variety of guestrooms and suites at this 49 room motel. Ideal for the romantic getaway is the Heart Shaped Jacuzzi Suite, complete with a Queen Bed, Jacuzzi for 2 and complimentary champagne. Giant Family suites with 3 double beds in one room are available as well. All rooms feature wireless Internet, free parking, telephones, and a 20″ Satellite Television. Within walking Distance of the Falls and situated in the Heart of the Niagara Tourist Area, This Niagara Falls Ontario Motel features an Outdoor Heated Pool and Free Continental breakfast. The Fairway Motor Inn is only 5 minutes from Skylon Tower, Casino Niagara, Clifton Hill and many exciting tourist attractions. Enjoy clean comfortable accommodations at great rates at the this wonderful motel in Niagara Falls. Choose from a selection of family rooms, efficiency units, and luxurious jacuzzi suites. The Fairway Motor Inn near the Falls is in the midst of Niagara’s Fallsview District. Enjoy a selection of dining, shopping, sightseeing and entertainment in the surrounding area.